At AltoAlto we make the distinction between a PowerPoint presentation and a PowerPoint template. The difference? We’ll explain it to you! When we design a PowerPoint presentation, we litterally start from zero. This means that we design the presentation whether or not in the corporate style of the company and that we restyle the content that we receive from you. For example, we design such a presentation for special events, corporate meetings, and so on. It is actually a presentation perfectly suited to a particular occasion. 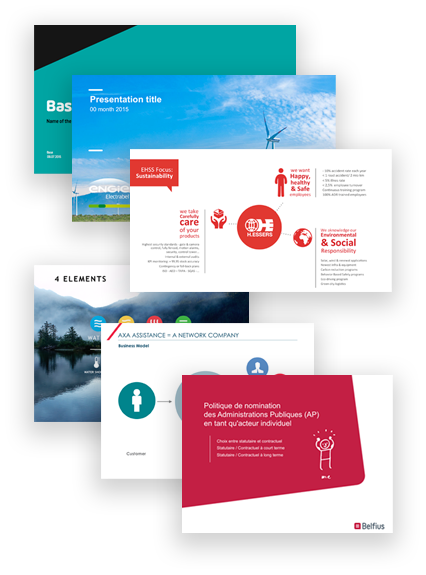 Are you looking for a presentation where all the basic elements of your corporate style already are included? Then we are happy to design a practical PowerPoint or Keynote template. That template gives you the opportunity to get started yourself or to present your employees a practical template for their presentations. In this way everyone in the company uses the same design to present. The look & feel of your company should be clear to everybody. Our PowerPoint templates are comprehensive and contain all the necessary elements to make your own presentation. Time-saving and efficient; that’s what is important at AltoAlto.